Making rabbit clothes can serve both decorative and functional purposes. If you're looking for a way to keep your rabbit warm or just keep her looking fancy, making rabbit clothes is a good hobby to try. Sew a coat first, and then you can move on to more complicated designs. 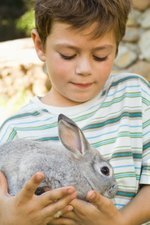 Measure around your pet rabbit's neck, allowing at least one finger to slip under the tape comfortably. Record the measurement. Measure from the base of your rabbit's neck to the spot where its back begins to slope downward, and record that measurement as well. Fold a piece of fabric in half, and measure and mark the fabric horizontally along the fold with the measurement from step #2, adding two inches for a seam allowance. Measure from the beginning, middle, and end slope of your rabbit's back to its tummy (middle) or top of the legs (beginning and end slope) and record it. Using these measurements, draw chalk lines vertically from the line you made in step #3. Connect these new lines horizontally using your chalk, rounding them slightly with a free hand touch. Cut out the doubled fabric, unfold it, and hold it up to your rabbit's body. If some areas seem too long, mark them with your chalk and trim. Place your shaped fabric (right side facing away) onto a single layer of fabric (right side facing up) and trace around it using your chalk. Cut the new shape out and then pin the pieces together, with the right sides of the fabric facing inwards. Turn the coat right side out and press, and then turn the edges of the unsewn neck section in about .5 inches and press. Use a needle and thread to stitch the coat to the back of the collar, and then put the collar on your rabbit to attach the coat.